There are many ways to get there: whether to the Messe München exhibition center, the ICM – Internationales Congress Center and the Messe München Conference Center Nord in Munich-Riem, or the MOC Veranstaltungscenter in the north of Munich. All travel information can be found here. During some trade fairs, we offer our own airport Messe München shuttle to and from Munich Airport. The busses depart every 20 minutes and travel nonstop to the trade-fair grounds. A one-way trip takes approx. 45 minutes. The ride costs EUR 9 one-way or EUR 15 round trip, unless otherwise noted. Shuttle-bus stops are located directly in front of the areas A and Z (the central area) in Terminal 1, and in front of Terminal 2. From 08:00 till 18:00 shuttle busses travelling to the trade-fair grounds depart from the airport every 20 minutes. The details refer to the departure-time minutes. Area D will not be reached. From 09:40 till 19:00 the shuttle busses run every 20 minutes from the trade-fair grounds to the airport. Please refer to the specific information on the shuttle-bus service provided by the trade fair you want to visit. On the website of the organizer you may find information about a shuttle service. The Lufthansa Airport Bus is a convenient way to get from the airport to the city and back. The Lufthansa Airport Bus departs from the terminals and the airport main-building and goes without stop to Schwabing north (U6 / Nordfriedhof station) and Munich central train-station. We recommend from Schwabing north by U6 to Kieferngarten station next to the MOC. We recommend purchasing an unlimited day ticket (Tageskarte): once devaluated you can travel the whole day—as an individual or in a group. The rental car center is located in the central area of Munich Airport between Terminal 1 and Terminal 2. Here you’ll find the offerings of many rental car companies. Cars are returned centrally to the parking garage P6 (“Car Rental Return”). Find all current flight routes along with detailed information on the website of Munich Airport. For possible irregularities in air traffic, consult the Lufthansa website. On the website of Deutschen Bahn, you’ll find all necessary information about travelling by train, including ticket information. The trade-fair grounds have two subway (U-Bahn) stops: Messestadt West and Messestadt Ost, of the line U2. You will need around 20 minutes from Munich central sation. The U2 subway line direction Messestadt Ost runs from 04:00 in the morning to 01:00 at night, Monday to Friday between 06:00 and 20:00 every 5 minutes and takes you directly to Messe München and to ICM. When using this subway line you don’t have to change. Get off at the Messestadt West and / or Messestadt Ost stop. The travel time is approx. 18 minutes. To get to the MOC Veranstaltungscenter München you will need 20 minutes from Munich central station as well. Therefore you have to exit the subway stop Kieferngarten of the line U6 and you should plan a five-minute walk from the station.Take any suburban train (S-Bahn) and and switch at Marienplatz to the U6 direction Fröttmaning / Garching-Forschungszentrum and get off at the stop Kieferngarten. When using this line you have to switch once. The travel time is approx. 18 minutes plus a walk of approx. 5 minutes. We recommend the use of a Day Ticket: once devaluated you can travel the whole day—as an individual or in a group. It takes the same time to travel to the MOC Veranstaltungscenter München in the north of Munich. You'll find taxis in front of the East Entrance and West Entrance as well as in front of the entrance of MOC. The rental car center is located in the central area of Munich central station. You’ll find information on the rental car service on the Deutsche Bahn website. The search helps you to find all companies’ stations. Traffic signs in the outskirts of town and throughout the entire city area indicate the way to Messe München, ICM – Internationales Congress Center München or MOC Veranstaltungscenter München in the north of Munich. Depending on which navigation system you use, you’ll find Messe München along with ICM – International Congress Center München in the category “event centers” or “exhibition grounds”, or under the keyword “trade fair”. Some navigation systems allow you to select between the center’s East, West, and North entrances. The entrance you have to get to depends on which entrances are open during the event you want to visit. To get this information, please refer to the event’s website. The trade-fair grounds are located directly next to the freeway A94. Reach it by taking either the exit Feldkirchen-West (Exit Nr. 6) or München-Riem (Exit Nr. 5). On the trade-fair grounds, a dynamic traffic control system regulates the flow of traffic. It directs you the free and closest parking spaces. During f.re.e and bauma you can also use the motor-home area. Detailed information can be found on the event’s website or by calling our hotline: +49 89 949-20720. * Only at trade fairs with a permitted camper park; staying overnight at the exhibition grounds is not permitted. Depending on the event and the requirements of the customers parking possibilities, fees and opening hours as well as the switch of the traffic-guidance system are going to be arranged induvidually. You will find relevant information on the website of the organiser. Depending on which navigation system you use, you’ll find the MOC Veranstaltungscenter München in the category “event centers” or under the keyword “MOC”. MOC Veranstaltungscenter München is easy to reach by car, thanks to direct motorway connections. Leave the freeway A9 direction Nürnberg / Salzburg at the exit München-Freimann (No. 74). You will be on Heidemannstraße from which you have to turn left after 500 meters into Lilienthalallee. In advance of events, signs throughout the city of Munich will show you the way to our location. There are 1,500 underground parking spaces available on-site. Depending on the event and the customer's requirements, the corresponding parking facilities and opening hours are individually arranged. Relevant information may be found on the website of the organizer. In the run-up to the events, depending on the agreement with the organizer, traffic signs in the city of Munich will show you the way to our location. There are 1,500 underground parking spaces available. In the underground car park both women's and disabled parking spaces are available in sufficient numbers (subject to a charge) in both levels. If you need disabled parking spaces in the taxi line, please contact us. Only cars with a green fine-particle sticker are allowed to drive within the low-emission zone of Munich. Cars with yellow and red stickers are forbidden in this area. Infractions are fined and drivers receive a point in the Flensburg register. The city center which is located within the federal highway “Mittlerer Ring” (B2R) is defined as low-emission zone. The “Mittlerer Ring” itself is not part of the low-emission zone. In collaboration with DEKRA, we offer a service to get the necessary fine-particles sticker for a fee. Under Munich’s clean-air initiative that went info effect on February 1, 2008 there is a ban on the through traffic of trucks weighing more than 3.5 tonnes. The barrier concept diverts through-traffic trucks to the A99 freeway, which generally alleviates traffic jams at the city limits. Instead, traffic is diverted and rerouted via warning signs in outlying areas (Sign 253 of the StVO, the German traffic regulations, with the words “Lieferverkehr frei”, delivery vehicles permitted), and with detour signs to the nearest freeway. Delivery trucks with origin from or destination to Munich are excluded from the ban. 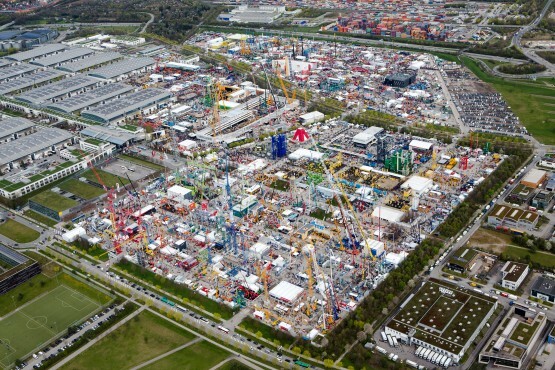 This means that deliveries to and from the Munich trade fair are not affected. However, trucks with destinations outside of Munich are not permitted to take the A94 towards Munich when leaving the trade fair. Doing so would make them through-traffic, which is prohibited. Messe München and the ICM – Internationales Congress Center München as well as MOC Veranstaltungscenter München are directly connected to Munich’s public transportation system, which is fast, reliable and environmentally-friendly. The trade-fair grounds are located directly next to the two subway (U-Bahn) stops Messestadt West and Messestadt Ost of the line U2. For events at the ICM – Internationales Congress Center München, please exit at the stop Messestadt West. The line U2 direction Messestadt Ost runs from 04:00 to 01:00, Monday to Friday between 06:00 and 20:00 every 5 minutes. The MOC Veranstaltungscenter München is located in the immediate vicinity of the subway (U-Bahn) stop Kieferngarten of line 6 direction Garching-Hochbrück. It takes approximately five minutes to walk from the Kieferngarten station to the MOC. Signs point you the way from Kieferngarten to the MOC.